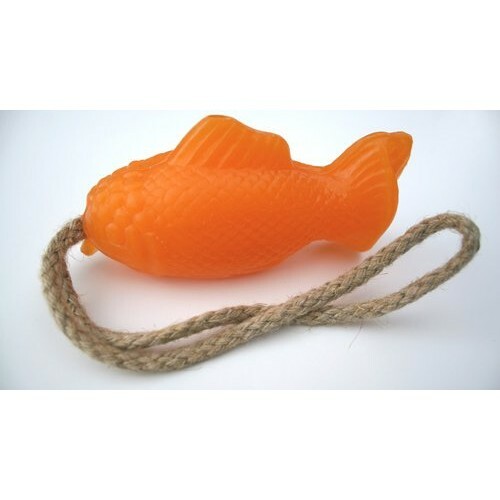 This cute all-natural goldfish is the catch of the day! Each soap is 100% vegetable based and at over seven ounces larger than it looks! The Go Fish comes with it's own stringer and can be hung with other Go Fish to form an attractive display. Unlike most fish, this one is welcome in the tub and has a light, fresh fragrance featuring our own special blend of essential oils. Each soap is handmade and comes in a clear gift box. This affordable novelty soap is a memorable gift for dad's, grandpa's and uncles! Made by hand in the U.S.A.